We know that nobody likes the thought of being told what they may and may not do in the privacy and comfort of their own home. As long as your space makes you happy and is practical, who cares, right? We most definitely agree, which is why we our hints at interior design and furnishing tips are only meant as guidelines – like our suggestions today for kitchen colours. Whether you like your culinary work zone to be a fun-coloured one or a more toned down, neutral-hued space, we say if it makes you happy (and doesn’t impact on your ability to conjure up the occasional meal for you and your family), then go for it! But should your mind clamp shut at the sight of paint colours, causing an overload of information that makes it difficult for you to determine which shade would suit your modest little kitchen best, may we make the following suggestions? 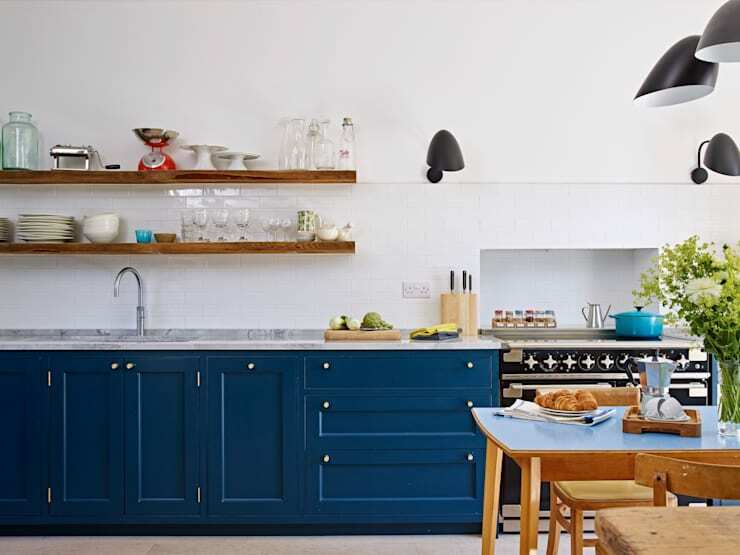 Here on homify, we always heart blue, regardless of what hue it’s presented in. As a calming colour, we find that it adds a depth and classic touch that few other colours can accomplish. Do you think it might add a charming touch to your little kitchen? This kitchen space, courtesy of Holloways Of Ludlow Bespoke Kitchens & Cabinetry, showcases a deep blue that resonates quite superbly with the adjoining white tones, conjuring up a vibe that is charmingly nautical. And those fantastic natural wood accessories and casual storage set up supports these tones most wonderfully. Would another colour have been as successful, as striking, and as inspiring as this decadent blue? We’re certainly not convinced. 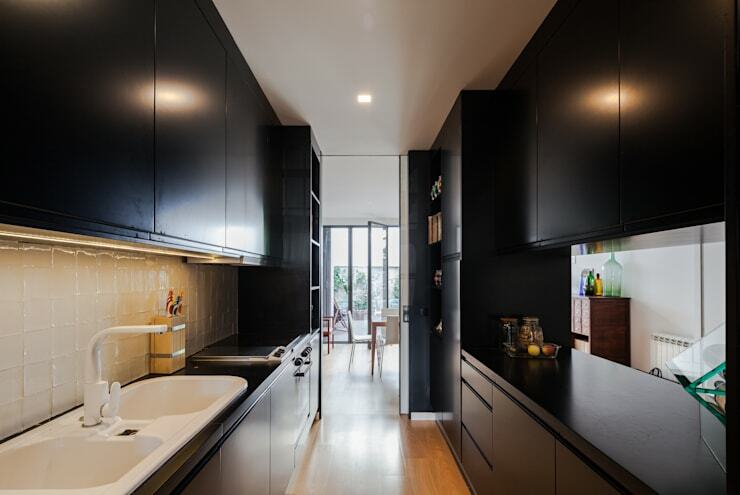 No, no, no, you might think, dark colours are not fit for a tiny kitchen! Really? Says who? Cast aside the notion that black shrinks a room and causes it to feel most claustrophobic, and dare to give this room another glance! Floret Architects certainly did, and it worked a treat. That dark colour perfectly demonstrates just how chic, stealthy and striking the right shade of black can look. And instead of making the space feel too small, it lends a new authority to the room – and we just love how bold it turns out to be! If you want your kitchen to be loud and proud, you may as well op for a dark shade to do it for you. When it comes to zhushing up a small space, a lot of people opt for pale colours, most often including white (or hues thereof). In a small space, white can help to make the room seem larger than it actually is, but it can also really draw attention to what you want to hide! Therefore, before you go too clinical with your choice of white, rather balance it out with some cheeky little pops of colours added here and there. ‘Til The End Studio opted for some potted herbs to add a splash of fresh green, but feel free to up that vivacious colour effect by hanging some brightly toned dishcloths, or displaying cooking books in richly coloured covers. Remember: it’s all about the balance! If you feel that black might be too heavy and white too safe, then mixing the two can produce quite fascinating results. 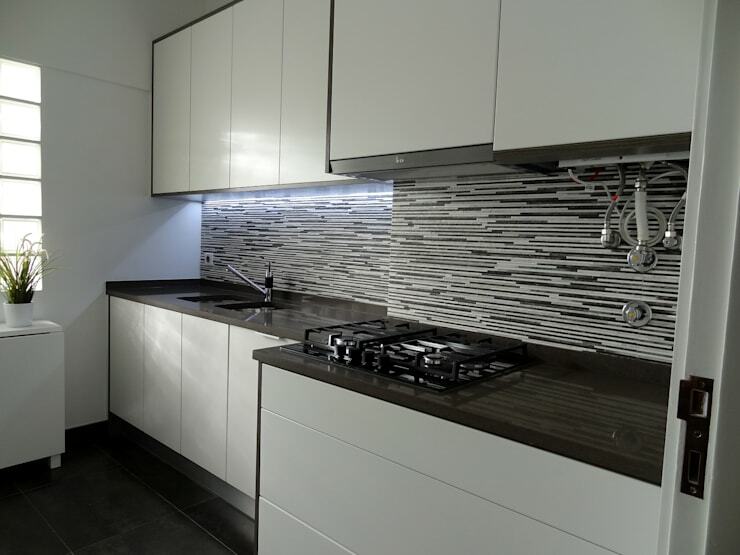 It can be the perfect way to embrace a little high-end contemporary beauty, as black and white brings in that age-old contrast that always works, no matter in which space it is presented. 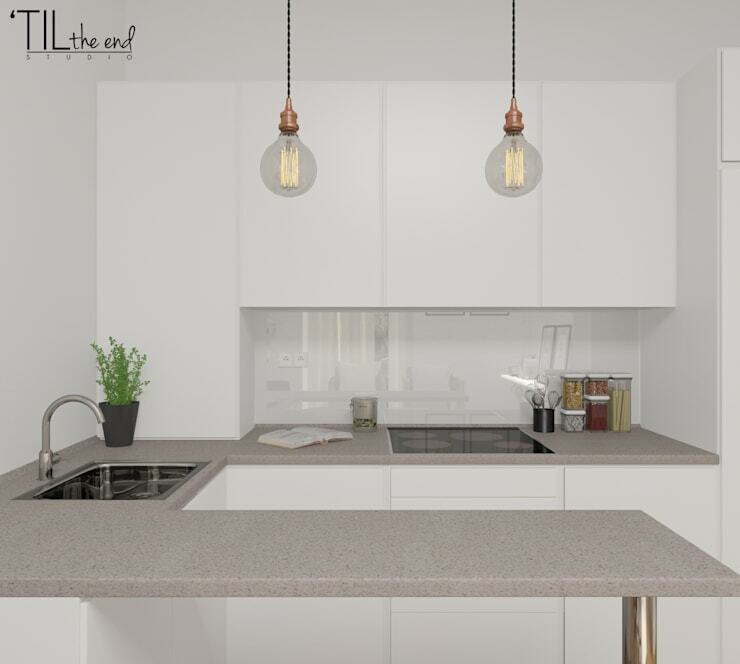 Your small kitchen does not have to consist of just one solid colour; combining two strong shades together can be very effective. You can choose to highlight certain features with the lighter colour, while the darker one can distinguish the other elements. Attention, folks: your small kitchen colours don’t have to be muted, although it can be a very effective option. In fact, you can be as bold or as bubbly as you dare, so don’t be afraid to throw that tiger orange together with that parakeet green. 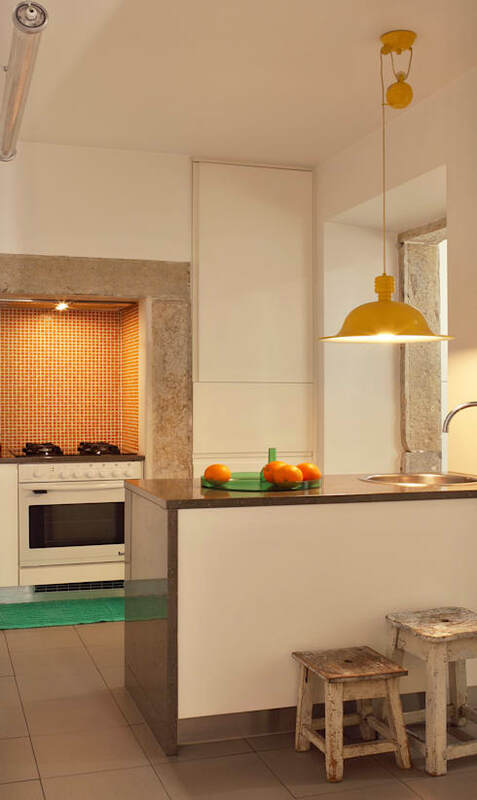 We adore this kitchen space by Tiago Patricio Rodrigues. It may not be huge, but it makes a grand use of some vibrant shades, and does so with an unapologetic tone. Those orange mosaic tiles make the stove the star element of this culinary show, while the bright green accents light up the space wherever they appear. And just in case that white might become a little too overbearing, a mustard yellow saves the day in the form of a hanging ceiling light! We mentioned that muted colours can be very effective for your kitchen, and here is our evidence. Just because they are softer than vivid primary shades, does not mean that they don’t have a striking impact on space. 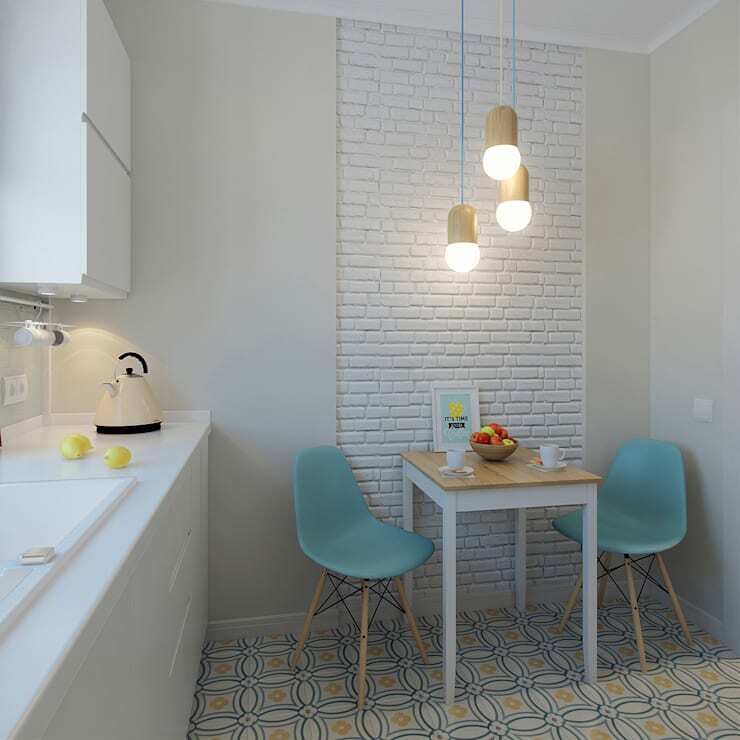 We love this design by Ekaterina Donde Design above, where the floor brings up a pop of colour. And here you thought that small kitchen colours only referred to cabinets and walls, right? Look at how effectively that floor adds a new dimension of style. The charming yellow and turquoise tiles are supported by little accents throughout the room, like the dining chairs and the lighting wires. A tiny space that has a delightfully huge character! Hold on, because we’re just getting started on our styles for small spaces! See homify’s Grand ideas for small bedrooms.